Guzaarish (Hindi: गुज़ारिश, translation: Request) is an upcoming Hindi romance film directed by Sanjay Leela Bhansali, starring Hrithik Roshan and Aishwarya Rai in the lead roles. The film is produced by Sanjay Leela Bhansali and Ronnie Screwvala under the banner of SLB Films and UTV Motion Pictures. The film is scheduled for release on November 19, 2010. The first look of Guzaarish was released on September 23, 2010. The story is set in Goa, home to one of the most accomplished magicians of the time - Ethan Mascarenhas (Hrithik Roshan). As fate would have had it, Ethan is severely injured when one of his magical trick goes wrong turning him to a paraplegic. Confined in his own wheel chair Ethan's will power only goes stronger and stronger. He becomes the Radio Jockey of an FM Station called Radio Zindagi. His show spreads magic and hope and laughter through his irrepressible wit and humor to every listener and caller, that it is difficult to imagine that this is a man who has been immobilised with a spinal injury for the last fourteen years of his life. Sofia D'Souza (Aishwarya Rai) is his elegant nurse who has been accompanying him like a shadow for past twelve years. Ethan's life centers on Sofia and they share a silent tacit love which is both beautiful and spirited. However, at the fourteenth anniversary of his accident, Ethan decides to take matters to his own hands and files an appeal to the court for mercy ****ing.This leaves Sofia in an impasse that challenges their relationship and their love. Ethan takes the help of his best friend and lawyer Devyani Dutta (Shernaz Patel) to support his appeal. Devyani , a very practical person, understands Ethan's appeal and agrees to his reasoning and decides to support him in his cause, as a result of which she is sensed as being callous by others. Surprising everyone with her stance Ethan's mother Isabel Mascarenhas (Nafisa Ali) also supports him in his petition, backing her son's demand as always. Though Ethan is consistently persuaded by his physician Dr. Nayak (Suhel Seth), a neurologist, to retract his case, he finally relents to Ethan's appeal when he realizes that the friend in him is much stronger than the medic. Alongside all the confusions, a young man named Omar Siddiqui (Aditya Roy Kapoor) enters Ethan's life with the sole aim of learning magic from him , whom he considers to be the greatest magician.Omar is earnest and driven by a passion to learn magic, hyper kinetic, quicksilver in his actions - an antithesis to his Ethan's inertness. Impressed by his love for magic, Ethan agrees to pass on his legacy to Omar even as he fights tooth and nail to demand the most basic right to his own life. The scenario takes an unexpected turn when Ethan's past lover, and now a wife and a mother with a work of her own, Estella Francis (Monikangana Dutta) re-enters his life, to whom her relationship with Ethan is a tragic memory of past. She's put her past behind her but is forced to revisit fourteen years later when she learns about Ethan's decision. The ethics, the morality, the cruelty and the kindness of Ethan's mission causes everyone to be struck by a whirlwind of emotions scaling from enrage to sorrow. After completing Saawariya, Sanjay Leela Bhansali had decided to focus more on his SLB Film production house. Chenab Gandhi starring Amitabh Bachchan, Vidya Balan, and John Abraham was being talked about in the industry. Meanwhile, he was also focusing on his sister Bela Sehgal's directorial venture, earlier titled, Hadippa. A few news reports suggested that Bhansali had confirmed his next project - a young love story called Hamari Jaan Ho Tum, starring Udit Narayan's son Aditya Narayan and Mahesh Bhatt's daughter. He had denied the rumors stating he was not into any such project. Other reports stated he had begun working on a film called Heera Mandi. Bhansali had got two male actors and one female actress flown in from Pakistan to train them in acting. But with the death of Begum para, one of his actors in Saawariya, who was also supposed to star in Heera Mandi, the crew had ran into casting problems. So Bhansali started working on an untitled film starring Aishwarya Rai and Hrithik Roshan. Later Bhansali himself cleared the air in an interview that, though he had met a Pakistani actor called Imran Abbas on the insistence of the writer of Heera Mandi, Moin Beg, at around the end of 2007, but came to know that the actor did not fit Bhansali's needs. But he did confirm that he would definitely make Heera Mandi much later and when it happens he would think of the casting. Bhansali first told media about his next directorial venture, when he gave an interview to the Indo-Asian News Service (IANS). In the interview he said that he had decided to call his film, Guzaarish, which is set to be shot in Goa. Bhansali told that Guzaarish is his tribute to the legendary singer Lata Mangeshkar; "I learnt direction from her voice. ‘Guzaarish’ is my tribute to Lata-ji’s artistry,” Bhansali told IANS. He added that the screenplay of the movie too is inspired by Lata’s passion for excellence. He said that Lata's songs and their lyrics had been used "...to fuel the intense love story. For instance, the song Hai tere saath meri wafaa, main nahin to kya? forms an important part of the film..."
When queried on why he chose a topic which explored the life of a paraplegic, the filmmaker said he likes taking up subjects that are closer to life and not very talked about. He further told that the movie makes one "...aware about the beauty of life and what we have and how we should cherish what we have.. I have learnt so much about living a good life, of becoming a better human being and of evolving as a person". Bhansali was in the look out of a matured pair for the portrayal of his lead roles in Guzaarish. His admiration for his muse Aishwarya Rai was very well a known fact. After watching her films Dhoom 2 and Jodhaa Akbar, both of which had starred both herself and Hrithik Roshan, Bhansali decided that the pair exuded a dignity and elegance much needed for his film. He also told IANS that Hrithik and Aishwarya have been chosen to play the passionate lovers in Guzaarish because to Bhansali, they epitomized the physical and spiritual beauty of Lata Mangeshkar's voice." When the stars where signed on dotted lines, Hrithik Roshan was filming for the film Kites, while Aishwarya Rai was shooting in Kerala for the bilingual Raavan/Raavanan. As a result though Bhansali wanted to start the shooting of the movie by early 2009, the start got delayed since the lead actor suggested to postpone the film until he wraps up his home production Kites." He added that, the project was "..definitely going into a different territory, in more ways than one,” he said, hinting at a unique shooting location. Later sources from the movie said that bulk dates of the two actors had been taken and for the following four months, the film would be shot in Mumbai and two other outdoor locations, which were not disclosed then. It was reported that Roshan would start shooting from July 2009. On her part, Aishwarya Rai said that both Bhansali and herself had evolved together and were both similar — totally driven and passionate. She told that the director ".. was so excited when he found the right script for us to work together in". She had similar views about her co-star Hrithik Roshan with whom, she said, she shared an amazing rapport. Apart from the two big stars, Bhansali had also signed model Monikangana Dutta to play Hrithik’s former love interest in the film. Sources had revealed then that Dutta would be playing the role of Hrithik's estranged lover. It was informed that Dutta had been signed for a two-movie deal and that "...Guzaarish would be the first and the second might be a solo launch for her. Monika is obviously very excited about bagging the role. She is not allowed to make many public appearances and remains discreet about the film deal...” Bhansali was very tight lipped when asked about Dutta and gave a very brief response saying that her role was pivotal to the film. During the music release of Guzaarish, it was revealed that Hrithik Roshan and Aishwarya Rai were the first choices of the director. Though Rai had agreed to the script without even reading it, Roshan was all set to say no to Sanjay's next. According to Hrithik Roshan "... five minutes into the story narration, I knew that I just couldn’t say no". Hrithik felt that though he had "..played superheroes before. But I feel my character in Guzaarish is the biggest superhero. I learnt how to live life after playing this role. This film will make you smile and give you courage". Bhansali said that he had always wanted to work together with Roshan for a very long time as he was impressed by his sincerity as an actor. He added that the script of Guzaarish gave him the right opportunity to sign him. About the leading lady, Aishwarya Rai, he said that the role suited her to perfection and though she would have accepted his offer blindly, it was important for an actor to be convinced of what he or she is doing. Bhansali told that if any one of the leading cast had disagreed, he wouldn't have made Guzaarish. According to him "..the film was only possible if Hrithik and Aishwarya had acted in it". Amita Sehgal, Casting Director, roped in other casts including Shernaz Patel who was last seen in Bhansali's Black as Michelle McNally's mother, Catherine McNally. Vijay Crishna who was seen in Devdas as the authoritarian father made a come back in the Bhansali's cast ensemble. There were rumors initially that Suhel Seth who was last seen in Pooja Bhatt's Rog had been roped in to play Hrithik's doctor, which were later confirmed. Further, inclusion of Nafisa Ali cemented Bhansali's penchant for picking up his cast from the off beaten track. Another inclusion was Aditya Roy Kapoor, brother of UTV Executive Producer, Siddharth Roy Kapur, who also was working simultaneously in another of Aishwarya Rai's film, Action Replayy. It was reported that yesteryear actor couple Dharmendra and Hema Malini's younger daughter Ahana Deol and Aditya Pancholi and Zarina Wahab's son, Sooraj Pancholi served Bhansali as Assistant Directors (AD) on the sets of Guzaarish. While Sooraj Pancholi did work as an Assistant Director for the first 2 schedules, Ahana Deol never worked as an AD. Theater actor Makrand Deshpande was roped in to play an important three-minute cameo in the film on Hrithik Roshan's suggestion. Dileep Subramaniam is the sound designer of the film. He has years of experience as sound designer in films like 'My Name is Khan' and currently on floor Imtiaz Ali's 'Rockstar'. Before starting the filming of Guzaarish, Bhansali visited Ajmer Dargah in Rajasthan for seeking blessings. Bhansali also met the singing legend Lata Mangeshkar, whom he had revealed to be the source of inspiration to him, to seek her blessings before he fully delved into filming Guzaarish. During the meeting, Mangeshkar told that she was a big fan of Bhansali’s films and that she was fortunate to be the source of inspiration behind such a talented director’s film. She told the media members that “..Even I had heard that he makes his singers hear my songs over and over again before making them sing. I’ve always been a big fan of Sanjay’s films, specially Black. I remember watching the Filmfare Awards in the year of Black. Every time the nominations were announced I prayed for Black to win. And it did. If I’m a source of inspiration to him then I count myself fortunate”. Bhansali candidly admitted that he was very much afraid of meeting Lata since "..one doesnt hobnob with one's god". He added that once he reached her home, he "... just wanted to sit and gaze at her. I realised in person she’s as magical as she is in her singing. There’s something other-worldly about her, a quality I haven’t encountered in anyone else in my life”. Like all his other films, Bhansali preferred shooting at a studio. Bhansali says, "I like to construct sets and then light it up. It is a part of my story telling. My story needs a setting and I like to create that ambiance." Hence he chose Filmcity, Mumbai to shoot the movie. Before the actual filming started, Hrithik Roshan spent time with a lot of patients to understand his role better and get into the skin of his character. He revealed that he used to “.. spend six hours with the patients, initially once a week and then once a month. I used to go to understand what they go through, what they think, what their needs are. They have taught me a lot of things. So if I have benefited from this experience so much, I am sure that when people see the film and understand the character, they will get a lot to learn”. Since Roshan's character was a paraplegic, Bhansali wanted to give him a natural look. Hence he was instructed by the director not to indulge in his regular workouts since he cannot look fit and trim in the film. He was also asked by the director to spot an original beard unlike the artificial one in his previous film, Kites, so as to give touches of authenticity to his character. The movie is set in Goa ,and hence, Bhansali wanted to give a Portuguese touch to his frames. Sumit Basu, the Art Director, created Ethan's House in Meh**** Studio with a very Spanish/Portuguese flavour and the auditorium for magic acts, the court room, Martin's Bar in Yash Raj Studio. Also keeping in mind the costumes Bhansali hired Sabhyasachi Mukerjee as the costume designer, who had worked Bhansali in Black. Mukherjee had earlier worked in the film Raavan with Aishwarya Rai the same year. Bhansali also wanted an authentic look to be given to Ethan's character and hence Hrithik Roshan was asked to grow a real beard as opposed to his artificial one in Kites. The film's shooting started on July 29, 2009 at Meh**** Studio, Mumbai. It was announced that the first schedule would be shot in July and August to capture the monsoon melody and romance of the place. It is notable that Bhansali came back to Goa after his first film, Khamoshi: The Musical for filming a movie. During the first day of shoot, he made sure that his mother was present on the sets. Sources told that his mother was his reason for making films and ".. it is imperative that she be present." Hrithik Roshan joined the crew on July 22. Aishwarya Rai joined the crew during the initial part of August after wrapping up the shoot for Raavan / Raavanan . A specially made to order remote-controlled modernized wheel chair was used in the movie for the role of Ethan Mascarenhas. House in Goa where the cast stayed. The next outdoor session of the film was done in Panjim. The lead actors had stayed at the Taj, Goa. During the day shoot at Divar, the unit's base camp was at an Englishman Jan Bostock's home in Divar island, just off Panjim for 4–5 days. Apparently, the film-maker, who is known for his hot-tempered nature threw the continuity sheets of one of the scenes being shot while shooting in the outskirts of Goa when one of his assistant directors made the same mistake twice. Hrithik Roshan sang a Hindi song in the film, after attempting playback singing in his previous movie Kites, in which he had rendered an English song. Bhansali himself personally trained Roshan for the song. Though the director had got the track recorded by another singer so that shooting in Goa can go uninterrupted, in case Roshan could not complete his recording his version was finally recorded though after four to five takes. Roshan later said in an interview that "Bhansali was really surprised on hearing it." During the filming of the movie, Bhansali also choreographed some of the songs. He used to dance on the sets of Guzaarish at times to make the moves clear to his actors. Many a times he will break into a dance himself to get the steps that he had in mind conveyed. This took most of his crew to surprise. Pony Verma, who was the choreographer for most of the songs in the film, revealed that as soon as Bhansali conceived a song, he would send it to her and then sing it to her as well. While shooting the song, a singer and a guitarist used to be on the sets. The choreography took place in midst of live guitar strings and song. According to Verma, this novel way of functioning had enhanced the appeal of the song. She added that when "... the song is playing live, you pick up a lot of nuances on the spot, which really helps the song". Verma was in full praises for Bhansali who gave her complete freedom over the choreography and also acknowledged the efforts put in by the lead actress Aishwarya Rai, with whom she had frequent discussion about the feel of the song. The third schedule of the film began on October 30, 2009. The grueling schedule lasted till January 2010, at the city's Meh**** Studios. Rumours had it that during the filming of the movie, Bhansali and Roshan got into a tiff over the excessive usage of English in the movie. Roshan, whose previous film Kites was also blamed for having non-Hindi dialogues, did not want to take risk and lessen Guzaarish's appeal. Though there was no comments from both of them, it was learned that the issue was sorted out later. Bhansali himself put all speculation to rest saying that ".. we (Hrithik Roshan and himself) were actually singing along quite happily." Later, towards the completion of the film, both the director and the producers, who realized the need to give the film a mass appeal, reworked on certain dialogues in English which were dubbed in Hindi. The final schedule of the movie was shot in Yashraj Studios from February 21, 2010. Bhansali found that on the other sets he had shot the film, he was being frequently disturbed by guests, due to which he was unable to provide full concentration the movie demanded. According to the crew "..Yash Raj Studios was not only classy and had all the facilities but it also doesn’t allow guests to come in." Taking these factors into considertaion Bhansali decided to bury the hatchet with Aditya Chopra over a film title and started shooting in the studios. The schedule included a spontaneous dance song with Aishwarya Rai, choreographed by Bhansali himself. The song "Udi" was pictured during this session which was choreographed by Longinus Fernandes, whom Bhansali had judged in Jhalak Dikhla Jaa, a popular dance based reality show. Fernandes was already known for his works in Slumdog Millionaire and Jaane Tu... Ya Jaane Na. According to him Bhansali "..wanted to make the song different and unique. I asked him if we can add a little bit of Spanish to it and give it a raw, earthy feel. He liked the idea, so we gave the whole dance a look which is very rustic to make it look as natural as possible". The choreographer added that the dance sequence was very distinct in that the audience had never seen Rai doing these such steps. He went gaga over the lead actress saying that she danced like a dream. Longinus said in an interview that it ".. did not take her long to learn the dance but it did take her some time to perfect it and to get into the mood of the character”. Since the character of Roshan, Ethan, plays a magician in the initial portion of the film, a Ukranian magician was hired for teaching him magic tricks, after a long search for a professional magician. The magic stunts performed by Roshan and Monikangana Dutta formed the major portion of the film shot in the last schedule. Among the many stunts shot there was a particular sequence in which Roshan had to dance using a large transparent ball as a property. The actor said that he had trained the hardest to practice spin in one of the dance sequence. Roshan said,"I trained for a month. It was not a long piece of dance but there was lot of jazz, ballet where I was required to spin as there is a ball in my hand and I am playing with it as well as dancing. None of my songs up till now have spin because I am very bad at it." The first look of the film was supposed to be releasing along with Dharma Productions' We Are Family on 3 September. Later the trailer was withdrawn from We Are Family. The official reason given for the postponement of the trailer was the time factor as the producers felt that there was a lot of time before the release of Guzaarish, and hence it was decided Guzaarish's first promotional trailer would feature in theatres a month later with Siddharth Anand’s Anjaana Anjaani. However the real story was that there were some concerns over a sequence showing Aishwarya Rai puffing away frantically at a cigarette in the trailer. While smoking is not entirely prohibited in Indian films, it is certainly seen to be injurious to health, especially since the one smoking on screen is a global icon playing a nurse. Sources close to the film revealed, “Aishwarya is not really smoking in Guzaarish. It’s a very cute, funny and a very beautiful sequence where she is trying to smoke when she doesn’t know how to." Irrespective of the context it had been decided that the release date of the first trailer would be postponed. Owing to the Ayodhya verdict, the release of Anjaana Anjaani too was postponed to October 1, which also saw the release of another Aishwarya Rai starrer Enthiran - The Robot. Hence Bhansali decided to have a separate promotional trailer launch on September 23, 2010 at Cinemax, Mumbai. Bhansali acted really tough and rejected as many as 200 designs before settling down for one. The first look opened to positive responses. The 1 minute, 48 seconds long trailer focused entirely on Hrithik and Aishwarya and was sans dialogue. The trailer was described by the critics as ".. delightful visuals, exhilarating background score, elaborate costumes, and understated but intense emotions - the promo has a signature Bhansali look and feel. It reminds you of Black, it reminds you of Saawariya. Faridoon Shahryar, Content Head Bollywood Hungama website, opined that the first look was ".. sheer poetry, amalgamation of mesmeric music, metaphorical imagery, a tinge of humour, a larger than life settings, and loads of pathos". Along side the release of the promotional trailer, posters and downloadable background materials were also spread officially through internet. During the presser, attended by Aishwarya Rai, Hrithik Roshan, Ronnie Screwvala, Aditya Roy Kapur, Monikangana Dutta, Shernaz Patel, other cast and crew of the movie and Bhansali himself, the director said ".. You go through so much in life, so many things about life is unspoken, hope and joy of living, and I thought it was important to make a film which dealt with a topic like this." A nervous Bhansali, who had met the media after a long time, said he was very afraid of handling a mic after a long time. He thanked UTV Chairman Ronnie Screwvala for his unrelenting support. Bhansali made headlines for the day when he said that Aishwarya Rai was ".. his muse, his jaan, and I get terribly excited when I make a film with her because she is very, very special. Some people are timeless and Aishwarya will be there for another 20 years". About the lead actor he said, "I have never enjoyed working with any other actor as much as I have enjoyed working with Hrithik, just for the kind of talent he has, for the kind of person he is". He also revealed the reason why he became the music director of the movie, "The reason behind doing music of the film is that I think I understand the characters and understand most what they would express musically than any other music director. Some deep thoughts are my concern, so whatever little music I knew, it was a sort of experiment. But I am happy with what I have done,". Aishwarya Rai told the press that "This was a very special film for us. We are glad to share this special piece of work with you before we reveal it to the rest of the world." Hrithik Roshan shared with the press that it was ".. true that I have not done anything that has been life altering. This movie has changed my outlook towards work changed my life. It is so beautiful that 30 years or 40 years from now, I’ll look back and smile I had the opportunity to make this film." Hrithik Roshan elaborated on his character saying that he was ".. a super character in the film. I have interacted with about 20 such patients who suffer from complete paralysis of the lower half of the body, including both legs which is mostly caused by damage of the spinal cord. They are real life superheroes and I am representing their emotions on screen". Adding that he never had felt this much responsible towards any other character he had played till date, he told the media that the film did not take any stance on mercy - ****ing. Roshan said that he was able to identify with Ethan Mascarenhas because, when he was going through the Guzaarish script,he had been nursing a knee problem and doctors told him that the knee will never be okay.According to Roshan, the script "..energised me so much that I was not depressed about my knee problem anymore". Further trailers of the song sequences Udi, Sau Gram Zindagi, Tera Zikr and separate "Making - of" videos of each songs were released subsequently through various online and television broadcasting outlets. Frequent interviews and pressers were conducted as a part of the promotional strategy. A controversy regarding the film's plot originated when veteran Indian writer Dayanand Rajan claimed that the plot of the film was plagiarised from his unpublished novel Summer Snow. "Guzaarish has many similarities with my novel. It's shocking that the main plot, the love story, the hero being wheel chair bound due to accident and even the mercy ****ing are the same as in Sanjay's movie. I had shown my novel to some people in the industry but I have no idea who leaked it to the writer of the film," says Dayanand. The other similarities include a serious accident, in both the scripts, which get the protagonist confined to the wheelchair to the woman taking care of him — it is the nurse who falls in love with Hrithik while in the novel it is his wife who looks after him. Both scripts having key flashback scenes and the woman supporting mercy ****ing for the hero. Raajan has dashed off a legal notice to the producers, UTV and SLB asking them for an explanation on how their film has so many similarities with his novel, however Bhansali's office refused to accept the notice. In late-October, a public interest litigation was filed Aditya Dewan, a lawyer, in Delhi High Court alleging that Guzaarish promotes euthanasia or mercy ****ing, which is illegal, and portrays the legal profession in bad light. He demanded a disclaimer from the producers saying mercy ****ing is not legal in India and there is a debate on whether such deaths can be allowed. But the case was dismissed by the court saying the facts averred in were inadequate for the court to appreciate and that it cannot be entertained in its present form. "PILs are loose too, for people with hidden agendas. The film is a love story of a man and his life and, yes, euthanasia is part of the narrative," told Screwala, the producer of the film. The soundtrack and the musical score have been composed by Sanjay Leela Bhansali himself, who makes his debut as a music director with this film. The lyrics are penned by A.M. Turaz, Vibhu Puri, and late Jagdish Joshi. The official music launch of Guzaarish took place on 22 October 2010. The event was hosted by Aditya Roy Kapur. Veteran actor Amitabh Bachchan, who had received his Best Actor National Award a second time for Bhansali's movie Black, was the guest of honour for the event, which also saw Bhansali's mother, Leela Bhansali gracing the occasion. Abhishek Bachchan also attended the event to extend his support for his wife. Actors Aishwarya Rai, Hrithik Roshan, Shernaz Patel, Suhel Seth, Monikangana Dutta, UTV chairman Ronnie Screwvala and Bhansali himself along with the entire music and background team were present in the music launch. When the album was released, Bhansali told the audience that he could never have got a better person to release his first album as a music director other than Amitabh Bachchan. Overcome with emotions he touched Bachchan's feet to get his blessings to which Bachchan reciprocated warmly and said “I am glad that Sanjay Leela Bhansali has made such a wonderful film with this issue which no one has seen till date”. Bhansali said, "I learnt music by listening to it over and over again. My association with R. D. Burman saab in Vidhu's (Vidhu Vinod Chopra) film and music composers such as Ismail Darbar and Monty (Sharma), helped me to learnt a lot." He reiterated the reason as to which why he scored the music for the movie but ruled out the rumor that he would be composing the music for all his forthcoming films. Bhansali said in an interview after the music launch, that though he had no favorites, the song "Sau Gram Zindagi" was close to his heart. Spreading light on how Guzaarish occurred, he told that he had conceived the lines Bas Itni Si Guzaarish Hain, Yeh Jo Baarish Hain while shooting for the film Black in 2003. Singers Shankar Mahadevan, KK, Kunal Ganjawala, Vibhavari Joshi, and Shail Hada, who had lend their voices to the film's soundtrack were also present in the event. The singers also gave a stage performance of each of their songs in the album. Bhansali along with the singers sang the song "Sau Gram Zindagi". He said that he dedicated the song to his mother since the lyrics represented her life in all ways. The highlight of the gala night was when the lead actors along with Bhansali sang the song, "Udi" to which the entire audience grooved happily. During the music launch, Hrithik Roshan was all praises for Bhansali saying that the director ".. is just pure genius, and that's exactly what he was as a music director as well. For most people Guzaarish is just another film, but for its just like nature you cannot possibly put into words this beautiful journey. It's beyond judgment for me." He also thanked Bhansali for making them a part of Guzaarish. Aishwarya Rai supported her director-friend saying "Sanjay is such a genius, anything he does he is the best at it. I'm just blessed and very grateful that I have gotten a chance to work with this genius three time in my career." Raavoyi Chandamama (1999) is a Telugu language film starring Akkineni Nagarjuna, Anjala Zhaveri, Keerthi Reddy and Jagapati Babu. Aishwarya Rai appears in a song sequence . The film is directed by Jayant Paranji and music is by Mani Sharma. It was dubbed and released into Hindi in 2000 as Sanam Tere Hain Hum. This is Telugu dubbed Mann and she is Rani;s role in a song. Mela (English: Fair) is a 2000 Bollywood film directed by Dharmesh Darshan. It starrs Aamir Khan, his real-life brother Faisal Khan, Twinkle Khanna, and Tinnu Verma. It was one of the biggest box office failures of the year 2000, especially since it featured Aamir Khan who had a track record of starring only in selected movies that consistently did well at the box office. 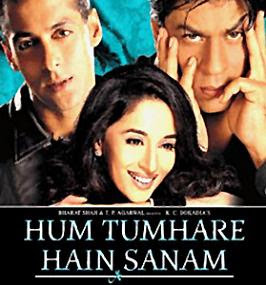 Hum Tumhare Hain Sanam (Devanagari: हम तुम्हारे हैं सनम, Nastaliq: ہم تمہارے ہیں سنم, English: I am yours, darling) is a Bollywood movie, made in India, released on 24 May 2002. The movie is a story of relationships with Salman Khan, Shahrukh Khan and Madhuri Dixit playing the main characters. It is the story of Radha (Madhuri Dixit), who has her little brother Prashant (Atul Agnihotri), her best friend Suraj (Salman Khan) whom she knows since childhood and her husband Gopal (Shahrukh Khan), whose jealousy towards Suraj and disapproval towards Prashant continually grows. The movie is K.S. Adhiyamans debut in Hindi, a remake of his own directorial in Tamil, "Thotta Chinungi". It took six years to complete. 23rd March 1931: Shaheed is a 2002 Hindi film directed by Guddu Dhanoa which depicts the events leading up to the hanging of Indian freedom fighter Bhagat Singh and his companions Rajguru and Sukhdev on 23 March 1931. The film stars Bobby Deol as Bhagat Singh, his elder brother Sunny Deol as another revolutionary Chandrashekhar Azad and Amrita Singh in her comeback role as Bhagat Singh's mother. Aishwarya Rai has a special appearance in a song. This is the second time real-life brothers Sunny and Bobby Deol appear in a film together after Dillagi (1999). They later came together for the 2007 film Apne. The film's release coincided with another film based on Bhagat Singh directed by Rajkumar Santoshi and titled The Legend of Bhagat Singh. 23rd March 1931: Shaheed failed at the box office, but "The Legend of Bhagat Singh" was hit at the box office, and noted for its soundtrack. However both were critically appreciated. This film picked up a Zee Cine Technical Award for Best Art Direction by Nitish Roy. Shakti: The Power (Hindi: शक्ती, Urdu: شکتی, translation: "Energy" or "Power") is a 2002 Bollywood movie. The film stars Karisma Kapoor, Nana Patekar, Sanjay Kapoor in the main roles. Shahrukh Khan has an extended appearance, while Aishwarya Rai has special appearance in an Item number. The movie is a remake of a Telugu film "Antahpuram". This was meant to be Sridevi's comeback film but was put on hold when she realised she was pregnant with her second child and asked her favourite Karisma Kapoor to step in. Karisma Kapoor and Nana Patekar's acting were acclaimed by fans and critics and received nominations at a number of award ceremonies. Bunty Aur Babli (Hindi: बंटी और बबली, Urdu: بنٹی اور ببلی, translation: Bunty and Babli), released in 2005, is an Indian Bollywood film directed by Shaad Ali and starring Amitabh Bachchan, Abhishek Bachchan, and Rani Mukerji. It was the first film to feature both Amitabh Bachchan and his son Abhishek Bachchan, and featured guest appearances by Aishwarya Rai and Tania Zaetta. It was one of the biggest hits of the year. The plot, although it draws on the idea of two rather lovable crooks, does not contain much violence. In fact each of the adventures of Bunty and Babli are thoroughly Indianised, like the fake selling of the Taj Mahal. It draws comparisons to the American classic "Bonnie and Clyde", however there are no dark elements to the film. In fact, as stated above, there is very minimal violence and the characters do not die a bloody death, unlike their American counterparts. The robberies done were usually to teach a lesson or exact revenge for some previous altercation. Aishwarya Rai Bachchan (née Aishwarya Rai,Tulu: ಐಶ್ವರ್ಯಾ ರೈ; born 1 November 1973) is an Indian actress and former Miss World. Before starting her acting career, she worked as a model and gained fame after winning the Miss World title in 1994. During her career, Rai has acted in over 40 movies in Hindi, English, Tamil and Bengali, which include a number of international productions. Often cited by the media as the most beautiful woman in the world, Rai made her movie debut in Mani Ratnam's Tamil film Iruvar (1997) and had her first commercial success in the Tamil movie Jeans (1998). She came to the attention of Bollywood in the movie Hum Dil De Chuke Sanam (1999), directed by Sanjay Leela Bhansali. Her performance in the film won her the Filmfare Best Actress Award. In 2002 she appeared in Bhansali's next project, Devdas (2002), for which she won her second Filmfare Best Actress Award. After a low phase in her career during 2003–2005, she appeared in the blockbuster Dhoom 2 (2006), which turned out to be her biggest Bollywood commercial success. She later appeared in films like Guru (2007), Jodhaa Akbar (2008), and Enthiran (2010) which were commercially and critically successful. Rai has thus established herself as one of the leading contemporary actresses in the Indian film industry. Rai was born in Mangalore to Krishnaraj Rai and Vrinda Rai. She has one elder brother, Aditya Rai, who is an engineer in the merchant navy and has also co-produced one of Rai's movies, Dil Ka Rishta (2003). At an early age her parents moved to Mumbai where she attended the Arya Vidya Mandir high school in Santa Cruz. Rai then entered Jai Hind College at Churchgate for one year, and then moved to Ruparel College in Matunga to finish her HSC studies. She planned to become an architect, and started studying architecture, but gave up her education to pursue a career in modelling. While pursuing her studies in architecture, Rai began modelling on the side. In the 1994 Miss India contest, she won the second place behind Sushmita Sen, and was crowned Miss India World. She went on to win the Miss World title the same year, where she also won the Miss Photogenic award. She abandoned her academic education after winning the pageant and spent one year reigning as Miss World in London. Rai then started working as a professional model and then moved on to her current profession as an actress. Rai made her acting debut in Mani Ratnam's Tamil biopic film, Iruvar (1997) with Mohanlal, The controversial film was a critical success and won many awards including Best Film award at the Belgrade International Film Festival, two National Film Awards, and two Filmfare Awards South. Rai appeared in dual roles, opposite veteran actor Mohanlal, with one of her roles being a cinematic depiction of political leader and ex-actress J. Jayalalithaa. Rai made her Bollywood debut in the film, Aur Pyaar Ho Gaya opposite Bobby Deol, which also released that year; the film did not do well at the box office, and was also panned by critics. However, her third project, S. Shankar's Tamil film, Jeans (1998) was a commercial success. The film was also noted for the song "Poovukkul", written by Vairamuthu, in the lyrics of which, she is compared to the seven wonders of the world and described as the eighth. In 1999 Rai starred in Sanjay Leela Bhansali's Hum Dil De Chuke Sanam opposite Salman Khan and Ajay Devgan. The film was centered on Rai's character, Nandini, who is forced to marry Devgan's character despite being in love with another man (Khan). As her husband tries to get her to her previous love, she eventually falls for him. Rai's portrayal won her critical acclaim, with a review on Rediff.com writing, "Aishwarya looks beautiful as usual ... This film will most likely draw her accolades from all over, maybe even get her recognised as an actress the way Manisha Koirala did in Khamoshi. In many scenes, there is no trace of makeup and she looks very fresh". The film became her first box office success in Bollywood and earned her first Filmfare Best Actress Award for her. In 2004 she appeared in Gurinder Chadha's Bollywood-style English adaptation of Pride and Prejudice by Jane Austen, Bride and Prejudice alongside Martin Henderson. She played the role of Lalita Bakshi, the film's counterpart of Elizabeth Bennet in Austen's novel. This was followed by Rajkumar Santoshi's Khakee with Amitabh Bachchan, Akshay Kumar, Ajay Devgan and Jayapradha; in the film she played a negative role for the first time in her career. In the same year she appeared in her second film with Rituparno Ghosh, Raincoat alongside Ajay Devgan. The film was highly acclaimed by the critics, with Rai receiving rave reviews for her performance. In 2006, Rai starred in J P Dutta's Umrao Jaan, a second film adaptation of the Urdu novel Umrao Jaan Ada (1905), written by Mirza Hadi Ruswa. She portrayed courtesan and poetess by the same name from 19th century Lucknow. The film was a critical and commercial failure, though Rai's work was generally well received. Critic Taran Adarsh wrote, "Aishwarya Rai looks ethereal. She has looked heavenly and performed so convincingly. She emotes through her expressive eyes and the consistency in her performance is evident from start to end". Later that year she appeared as a master thief, Sunheri, in Yash Raj Films's Dhoom 2 directed by Sanjay Gadhvi, with an ensemble cast of Hrithik Roshan, Abhishek Bachchan, Bipasha Basu and Uday Chopra. The film turned out to be a blockbuster and became the highest grossing film of the year in India, earning revenues of over Rs 770 million domestically. The film also sparked a controversy for a scene containing a kiss between her and Hrithik Roshan. However, Rai's performance in the film received mostly negative reviews with a reviewer on Rediff.com writing, "Ash's character too is all gloss and no depth. You seldom feel any tension in her behaviour and expressions as she accompanies the master thief on potentially dangerous missions. Sunehri enters the film nearly 50 minutes after its opening in a disguise. In no time, she is wearing the flimsiest of clothes. Once she opens her mouth—and she does it two minutes after appearing in the film—she spoils the image. There is no sensuality anymore, and half an hour later, one wonders what made the master thief fall for her." Nonetheless, her performance earned her a sixth nomination for Filmfare Best Actress Award. In 2007 she appeared in Mani Ratnam's Guru as Sujata. Speculated to be based on the life of Indian businessman Dhirubhai Ambani, it was a rag to riches story about an ambitious small town man who ends up as the owner of the biggest corporation in India. The film was premièred at the Elgin Theatre in Toronto, Canada, making it the first Indian film to have a mainstream international premiere in Canada. The film was critically acclaimed and performed well at the box office. Critical reception for Rai was mixed. While Nikhat Kazmi from The Times of India wrote that she is "just okay and fails to register the growth in her character", Rediff.com's Raja Sen described it as "arguably her finest performance, visible especially when she takes over the film's climax." Rai got her seventh Filmfare nomination for Best Actress for the role. In the same year she starred in Jag Mundhra's British film Provoked as Kiranjit Ahluwalia (an NRI woman who ****ed her abusive husband after facing severe domestic violence) alongside Naveen Andrews. The film was panned by critics and was also a commercial failure, though Rai received positive reviews from critics. In the same year she appeared as a female Indian warrior from Kerala named Mira in Doug Lefler's epic film The Last Legion alongside Sir Ben Kingsley, Colin Firth and Thomas Sangster. The film was a critical failure. In 2008, she starred alongside Hrithik Roshan in Ashutosh Gowariker's historical drama Jodhaa Akbar, a partly fictionalised account of the life of Muslim Mughal emperor Jalaluddin Muhammad Akbar, played by Roshan and his Hindu wife Jodha Bai, played by Rai. The film was a critical and commercial success, earning revenues of over Rs 590 million domestically. Rai's performance in the film was praised by critics, with Rajeev Masand writing, "Aishwarya Rai is wonderfully restrained and uses her eyes expertly to communicate so much, making this one of her finest outings on screen". She earned her eighth nomination for Best Actress at the Filmfare for her performance. Later that year she co-starred with husband Abhishek Bachchan and father-in-law Amitabh Bachchan in Ram Gopal Verma's Sarkar Raj, a sequel to his previous film Sarkar. She played the CEO of a major power company proposing to establish a new power plant in rural Maharashtra. In 2009 she appeared in Harald Zwart's spy comedy film The Pink Panther 2 playing the role of criminology expert, Sonia Solandres. Like its predecessor, the sequel received negative reviews from critics and did a moderate business of $75,871,032 worldwide. In 2010, she collaborated with Mani Ratnam for a bilingual, with both versions featuring Rai portraying a character based on the goddess Sita. Both films were shot simultaneously, with Rai's role being one of the only roles which were played by the same performer in both versions. Though her portrayal of Ragini in both languages were praised, the Hindi Raavan alongside Abhishek Bachchan failed commercially, whilst the Tamil Raavanan, became a massive success. On October 1, 2010, she appeared with Rajinikanth in the Tamil film Enthiran, directed by S. Shankar. which has become the biggest blockbuster in India ever. She will also appear in Sanjay Leela Bhansali's Guzaarish opposite Hrithik Roshan, Vipul Shah's Action Replay opposite Akshay Kumar, Abhinay Deo's next film produced by Farhan Akhtar and Vishal Bharadwaj's next directorial venture. In 2009 Rai was awarded the Padma Shri for her contributions to Indian cinema. In the same year she refused to accept the second-highest Order Of France, Ordre des Arts et des Lettres as her father was suffering from serious illness, and she wanted her whole family to attend the award function. She is only the fourth Indian actor after Amitabh Bachchan, Nandita Das and Shahrukh Khan to be chosen for an Order Of France. In June 2009, she was declared the Female Star of The Decade at the tenth International Indian Film Academy Awards held in Macau. In 1999 Rai participated in a world tour called the Magnificent Five along with Aamir Khan, Rani Mukerji, Akshaye Khanna and Twinkle Khanna. In 2003 she became the first Indian actress to be a jury member at the Cannes Film Festival. Rai is the brand ambassador for The Eye Bank Association of India's nationwide campaign to promote eye donation in India. In 2004 she travelled to Siachen Glacier, which at a height of 13,000 ft is the highest battlefield in the world, to boost the morale of the jawans for a special New Year episode on the NDTV show, Jai Jawan. In 2005, she became a brand ambassador for Pulse Polio, a campaign established by the Government of India in 1994 to eradicate polio in India. In February 2005, Rai performed at the HELP! Telethon Concert to help raise money for the victims of 2004 tsunami earthquake in company with other Bollywood stars. In 2008 she along with her family laid the foundation of a special school for underprivilged girls in the Daulatpur village in Uttar Pradesh. The school will be made by her family and is going to be named after her. In 1999 Aishwarya began dating Bollywood actor Salman Khan; their relationship was often reported in the media until the couple separated in 2001. Rai cited "abuse (verbal, physical and emotional), infidelity and indignity" on the part of Khan as a reason for ending their relationship. However, in a 2009 Times of India article titled "Salman didn't hit Ash!" Khan denied ever beating her: "It's not true that I hit a woman." Rai is married to actor Abhishek Bachchan. After much speculation concerning their relationship, their engagement was announced on 14 January 2007. The announcement was later confirmed by his father, Amitabh Bachchan. The couple got married on 20 April 2007 according to traditional Hindu rites of the Bunt community to which she belongs. Token North Indian and Bengali ceremonies were also performed. The wedding took place in a private ceremony at the Bachchan residence "Prateeksha" in Juhu, Mumbai. Though the wedding was a private affair intended for the Bachchan and Rai families and friends, the involvement of the media turned it into a national extravaganza. They have been cited as a supercouple in the Indian media. Rai has been very close to her family and lived with them in Bandra, Mumbai, until her marriage. Rai has been the most popular face of Indian cinema globally. In 2004 she was chosen by Time magazine as one of the World's "100 Most Influential People", and appeared on the cover of Time magazine, Asia Edition in 2003. In October 2004 a wax figure of Rai was put on display in London's Madame Tussaud's wax museum. She was the sixth Indian and the second Bollywood personality after her father-in-law Amitabh Bachchan to get this honour. She was the subject of a 60 Minutes profile on 2 January 2005, which said that "at least according to thousands of Web sites, Internet polls and even Julia Roberts", she was "The World's Most Beautiful Woman". In that same year she became a global brand ambassador of L'Oreal alongside Andie Macdowell, Eva Longoria and Penelope Cruz. The same year, a special tulip in the Netherlands was named "Aishwarya Rai" after her. Rai became the first Indian to appear on such shows as Late Show with David Letterman, and was the first Bollywood personality to appear on Oprah's "Women Across the Globe" segment. In 2005, Harpers and Queen's list of 10 Most beautiful women in the world ranked her at the ninth spot. In 2009 she made an appearance on Martha Stewart's show Martha. The same year she also appeared on The Tyra Banks Show hosted by Tyra Banks. In 2010 she appeared for the second time in list Time Magazine's "100 Most Influential People in the World". Special appearance in the song "Kajra Re"
^ "The name’s Bachchan, Aishwarya Bachchan!". ExpressIndia. 2007-05-01. http://www.expressindia.com/news/ful...p?newsid=85796. Retrieved 2008-11-20. ^ His****‏, Geoff (2007). India's global wealth club. John Wiley and Sons‏. p. 6. ISBN 0470822384. ^ Chhabra, Aseem (9 February 2005). "Ash does fine on Letterman". Rediff.com. http://in.rediff.com/movies/2005/feb/09ash.htm. Retrieved 2009-05-09. ^ Assomull, Sujata (5 February 1999). "My first break -- Aishwarya Ra". Indian Express. http://www.expressindia.com/news/ie/.../ile05066.html. Retrieved 2009-06-15. ^ "'They should not break up soon'". Rediff.com. http://specials.rediff.com/movies/2007/apr/19video2.htm. Retrieved 2009-02-14. ^ "Letterman unveils Ash to America". Times of India. 2005-02-09. http://timesofindia.indiatimes.com/a...ow/1015866.cms. Retrieved 3 December 2008. ^ "Iruvar (1997)". Internet Movie Database. http://imdb.com/title/tt0119385/. Retrieved 2008-10-27. ^ Warrior, Shobha (2003-09-03). "25 years, 25 landmarks". Rediff. http://www.rediff.com/movies/2003/sep/03mohan1.htm. Retrieved 2009-04-02. ^ "Box Office India report of 1997". Archived from the original on 2007-12-17. http://web.archive.org/web/200712171...a.com/1997.htm. Retrieved 2008-11-20. ^ "Of Jeans and bottom lines". Rediff.com (V. Srinivasan). http://www.rediff.com/entertai/1998/mar/21jean.htm. ^ "Wonder of wonders". Rediff.com (Rajitha). http://www.indiaabroad.rediff.com/en...8/apr/20sh.htm. ^ "Hum Dil De Chuke Sanam". http://www.rediff.com/entertai/1999/jun/17hum.htm. Retrieved 2009-09-17. ^ Bist, Raju (2002-11-12). "Bollywood takes on the world". Asia Times. http://www.atimes.com/atimes/South_Asia/DJ12Df01.html. Retrieved 5 December 2008. ^ Sharmila Taliculam. "Soft 'n' sensational". Rediff.com. http://www.rediff.com/entertai/1999/aug/13taal.htm. ^ "Box Office India report of 1999". Archived from the original on 2007-12-21. http://web.archive.org/web/200712212...a.com/1999.htm. Retrieved 2008-11-20. ^ Corliss, Richard (2002-06-03). "Cannes Kiss Off". Time. http://www.time.com/time/magazine/ar...257165,00.html. Retrieved 2008-11-20. ^ "Box Office India report of 2002". Archived from the original on 2007-12-27. http://web.archive.org/web/200712270...a.com/2002.htm. Retrieved 2008-11-20. ^ "Box Office India report of Overseas Gross". Archived from the original on 2007-12-27. http://web.archive.org/web/200712270...m/overseas.htm. Retrieved 2008-11-20. ^ "Chokher Bali will widen my horizon". Times of India. 2003-07-06. http://timesofindia.indiatimes.com/c...how?msid=61693. Retrieved 5 January 2009. ^ "Rain coat is simply beautiful". http://in.rediff.com/movies/2004/dec/24rain.htm. Retrieved 2009-03-09. ^ "movie review". http://www.bollywoodhungama.com/movi...719/index.html. Retrieved 2009-03-06. ^ "All Time Earners Inflation Adjusted". http://boxofficeindia.com/cpages.php...l_time_earners. Retrieved 2009-03-04. ^ "Obscenity case filed against Aishwarya and Hrithik". The Hindu. 2006-12-02. Archived from the original on 2008-01-18. http://web.archive.org/web/200801180...0612021925.htm. Retrieved 2008-11-20. ^ Arthur J Pais. "Dhoom: 2 falls short of expectations". Rediff.com. http://specials.rediff.com/movies/2006/nov/24slide4.htm. ^ Canadian Press (2007-01-11). "Thousands attend 'Guru' premiere". Toronto Star. http://www.thestar.com/News/article/170274. Retrieved 2008-08-15. ^ "Canada mayor invites 'Guru' crew for world premiere". Indo-Asian News Service. http://mangalorean.com/news.php?news...l&newsid=37940. Retrieved 10 January 2007. ^ "International Business Overview Standard". IBOSNetwork. http://www.ibosnetwork.com/asp/curyeartotals.asp. ^ Kazmi, Nikhat (2007-01-13). "Guru". http://timesofindia.indiatimes.com/E...ow/1162401.cms. ^ Sen, Raja (2007-01-12). "Watch Guru for the actors". http://www.rediff.com/movies/2007/jan/12guru.htm. ^ "'Superbad' delivers super debut with $31.2 million debut". International Herald Tribune. 2007-09-19. http://www.iht.com/articles/ap/2007/...Box-Office.php. Retrieved 5 January 2009. ^ "Masand's Verdict: Jodha Akbar". CNN-IBN. 15 February 2008. http://ibnlive.in.com/news/masands-v...9060-8-p1.html. Retrieved 2009-08-18. ^ "THE PINK PANTHER 2". http://www.boxofficemojo.com/movies/...nkpanther2.htm. Retrieved 2009-08-18. ^ "Robot confirmed!". Sify. 2008. http://sify.com/movies/tamil/fullstory.php?id=14585005. Retrieved 2008-01-05. ^ "'Aishwarya is very special to me'". The Hindu. 2008-12-30. http://www.hindu.com/thehindu/holnus...0812301566.htm. Retrieved 5 January 2009. ^ "Aishwarya, Akshay, Helen in Padma Shri list". The Hindu. 2009-01-26. http://www.hindu.com/thehindu/holnus...0901260321.htm. Retrieved 2009-01-26. ^ "Ash won't accept award without Dad". The Times of India. http://timesofindia.indiatimes.com/I...ow/4059637.cms. Retrieved 2009-02-12. ^ "Ash refuses French award". http://movies.ndtv.com/newstory.asp?...TEN20090083244. Retrieved 2009-02-13. ^ "Magnificent Five". Elite Entertainment (bollywoodconcerts.com). http://www.bollywoodconcerts.com/pre...php?preshow=16. Retrieved 14 April 2007. ^ "Aishwarya Bachchan Rai". http://www.britannica.com/EBchecked/...warya-Bachchan. Retrieved 2009-02-14. ^ "Ash appeal fails to boost eye donation drive". http://timesofindia.indiatimes.com/a...how/145221.cms. Retrieved 2009-09-19. ^ "Actress Rai backs polio campaign". BBC News. 2005-08-22. http://news.bbc.co.uk/2/hi/entertainment/4172970.stm. Retrieved 2009-02-14. ^ "Bollywood unites to present caring face". The Telegraph. 8 February 2005. http://www.telegraphindia.com/105020...ry_4351693.asp. Retrieved 8 February 2006. ^ "Bachchans to build girls school in name of Aishwarya Rai Bachchan". http://www.ibosnetwork.com/newsmanag...px?a=21101&z=4. Retrieved 2009-02-20. ^ "Bollywood's taste of Delhi 2010". melbourne2006.com. 26 March 2006. http://www.melbourne2006.com.au/M200...Delhi+2010.htm. Retrieved 22 April 2006. ^ "Amitabh-Abhishek planning world tour together: India Entertainment". Earthtimes.org. http://www.earthtimes.org/articles/show/149172.html. Retrieved 2008-11-13. ^ "The World's Most Beautiful Woman?". CBS News. 2004-12-29. http://www.cbsnews.com/stories/2004/...in;contentBody. ^ "Salman Khan chapter was a nightmare in my life: Aishwarya Rai". http://www.expressindia.com/news/ful...p?newsid=20315. Retrieved 2009-09-19. ^ "Salman didn’t hit Ash!". Sep 10, 2009. http://timesofindia.indiatimes.com/e...ow/4991138.cms. Retrieved 2010-07-25. ^ "behindwoods.com". Abhishek Bachchan and Aishwarya Rai Engaged. http://www.behindwoods.com/tamil-mov...h-engaged.html. ^ "It's London in spring time!". 2007-04-04. http://timesofindia.indiatimes.com/a...ow/1858526.cms. Retrieved 2009-09-19. ^ "I didn't chicken out of Dostana, says Saif Ali Khan". http://www.hindu.com/holnus/009200908011821.htm. Retrieved 2009-09-19. ^ "Why did Aishwarya dump Vivek?". http://movies.indiatimes.com/News-Go...61,curpg-6.cms. Retrieved 2009-08-19. ^ "The buzz outside Ash's house". http://us.rediff.com/movies/2007/apr/18ash.htm. Retrieved 2009-09-19. ^ Perry, Alex (2004-04-18). "Aishwarya Rai". Time. http://www.time.com/time/subscriber/...ts/100rai.html. Retrieved 5 January 2009. ^ "The Leading Lady". Time Asia. 2003-10-20. http://www.time.com/time/asia/covers...7/int_rai.html. Retrieved 5 January 2009. ^ Arun, Neil (2004-10-01). "Bollywood goddess waxes beautiful". BBC News. http://news.bbc.co.uk/1/hi/world/south_asia/3706834.stm. Retrieved 2008-10-27. ^ "Holland tulip named after Aishwarya". http://www.apunkachoice.com/scoop/bo...0050610-4.html. Retrieved 12 February 2009. ^ "Aishwarya Rai Named 9th Most Beautiful Woman in the World". http://www.hhpulse.com/news/16/ARTIC...007-07-14.html. Retrieved 2009-02-12. ^ "Martha". http://www.theinsider.com/news/16337...Martha_Stewart. Retrieved 2009-09-19. ^ "Tyra Banks Show". http://www.locatetv.com/tv/tyra-bank...ason-1/6081355. Retrieved 2009-09-19.